Stanley village - The seaside town of Stanley is arguably one of Tasmania's most picturesque towns. 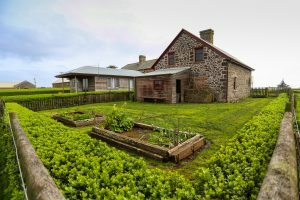 Stanley is a romantic town sitting on a slender sliver of land jutting out into the Bass Strait on Tasmania's northwest coast. It is remarkable for its incredibly well-preserved colonial buildings and its massive volcanic plug. The plug rises 150 metres out of the water and it dominates the small town skyline. 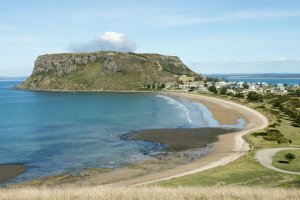 This heavy touristed town is perfect for a romantic getaway, but the name of the volcanic plug belies Stanley's quaintness. Called "The Nut," Stanley's cheeky geological feature is what visitors remember most. Devonport is the closest big city to Stanley. It'll take you more than 1.5 hours to drive to Stanley along the picturesque northwest Tasmanian coastline. Launceston is 225 kilometres away and nearly a 3-hour drive. Hobart, sitting on the other side of the island, is about 5 hours by car. Stanley is rich in history but its importance as a port has faded through time. Now Stanley is a quaint little fishing port that relies heavily on tourism. Tourists flock to this small peninsula for its remarkable geological feature, it's beautifully preserved colonial buildings and fresh boutique seafood. The Nut offers 360° views from the top. It is a strenuous hike that takes you 150 meters above the sea where you can marvel at Tasmania's beautiful and rugged northwest coastline. 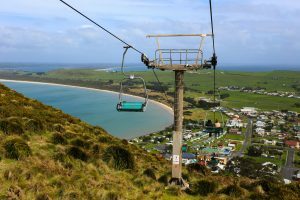 Or you can opt to take the chairlift if the steep hike is too much. Be sure to look below for sea lions basking in the sun and tiny Penguins coming back from a day's hunt out in the Bass Strait. 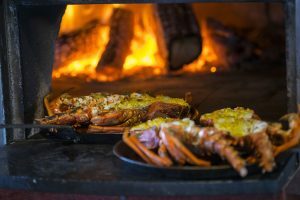 Image credit: Tourism Australia & Graham Freeman. Compared to the rest of the world, Tasmania's northwest coast is rather sparsely populated. That means the ocean waters beyond are some of the wildest and least touched marine habitats on the planet. And you can taste that unspoiled natural beauty when you order seafood in one of Stanley's restaurants. The fish and chips alone draw seafood lovers from all over Australia. The Nut is a remarkable geological feature. Volcanic rock spewed into the sky and called before it had time to come back down to the ground. Now this massive geological feature is a world-famous marvel. And Stanley's remarkably preserved colonial houses, quaint streets and beautiful views make a perfect leisure seeker's retreat. There is plenty of peace and quiet. It's easy to find the perfect place for reading a book to escape the frenetic pace of modern life. Image credit: Tourism Australia & Graham Freeman. There are a wide variety of accommodations on this tiny little peninsula. Most hotels and accommodations are quaint and you'll find them in the shadow of The Nut. Rooms may sell out in Stanley rather quickly so be sure to book ahead of time. The Stanley Discovery Museum and Genealogy Centre is an intriguing visit to discover the history of this small sliver of land. A historic walk-through town is also quite beautiful. Cozy little stone cottages line the streets which give Stanley a romantic feel. The former headquarters of the Van Diemen's Land Company is a colonial architectural marvel. Stanley offers up ghost tours at night and more informative walking tours during the day. Visit Highfield for sweeping views of Stanley's northern beaches. Make sure to bring your camera because The Nut towers in the background. And this farming region is another quaint little area to visit during your romantic getaway. Lord Stanley was the British Secretary of State for War and the Colonies in the 1830's. The town was named for him after the Van Diemen's Land Company was granted northwest Tasmanian land in 1825. The port quickly opened in 1827 and Stanley had its first school in 1841. Soon after, in 1842, Stanley was recognised as an official town. But the most impressive thing about Stanley's history is that it was the site of the first telephone line from the Australian mainland in 1936. A submarine telephone cable was run from Apollo Bay to connect Tasmania with the rest of the world. The Roaring 40s is the intense weather system that churns the entire Southern Hemisphere. Stanley sits right in the teeth of its strong westerly winds, so you are likely to encounter a bit of a breeze when visiting this historic peninsula. But there is an upside -- Stanley has some of the cleanest air on the planet. Be sure to take advantage of the thundering natural beauty around Stanley. You can find guided towards in town as well as scenic flights and coastal cruises. 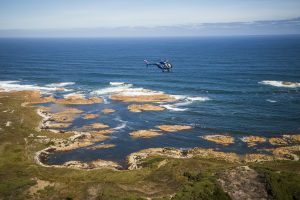 Guides are eager to take you to the nearby Tarkine Wilderness, Rocky Cape National Park and the Savage River National Park.